Here the complete setup for adding freenom custom domains on blogger website. A website which is created on blogger platform runs with a free domain as www.example.blogspot.com here the sub domain .blogspot is available and sends wrong impression on User. 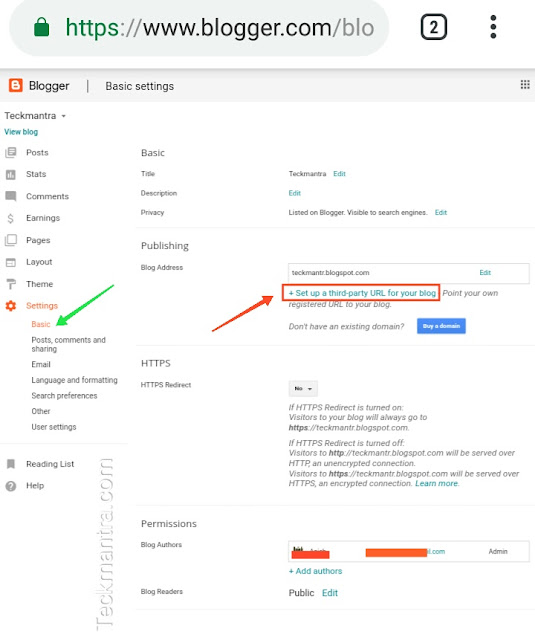 So you need a short or custom domain settings for your blogger website. People searching for How to add dot tk domain on blog website. Hey buddy do not worry here the solution for all Freenom domains. How to Setup Freenom Domains (.tk, .ml, .cf, .cq, .ga) as Blogger Custom Domain? 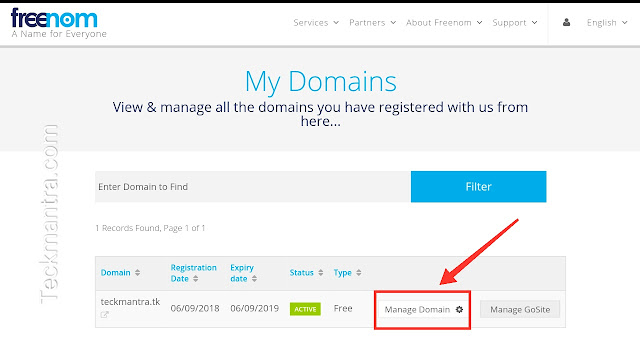 First You need to Register a custom domains from freenom. Here the .tk .ml .ga .cf and .gq are available for free for 1 Year. You are able to learn from here How to get free domains and add it (point to) blogger. People who search for How to point freenom domain to blogger, i think they have a freenom account as well as a custom freenom domain. 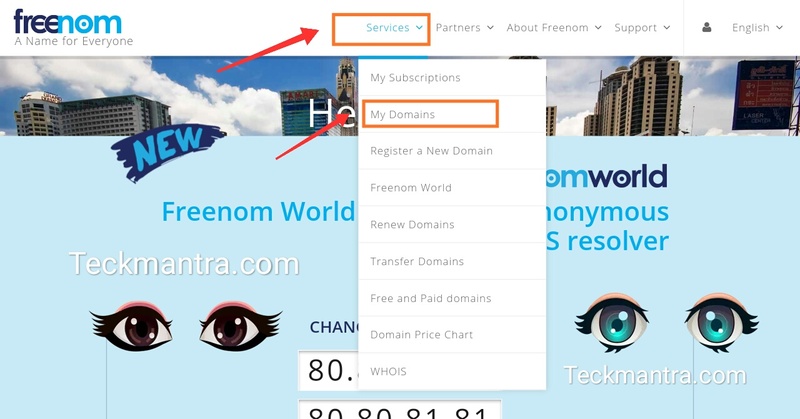 If You have not then see here how to register a custom domains from freenom for free. Go from service tab (situated in upper menu) to My domain. Here you see your all Register domains Click "Manage Domain" of that domain which one you want to add on your blogger website. In my case I'm going to add Teckmantra.tk on a sample blog. Here you will see all information about your selected domain. Click on "Manage freenom DNS"
Step : 2 Now take a New tab in your browser and Log-in to your blogger account where you want to put this domain. Step : 3 Type your Customs domain name in the box below with including www. Noe it's time to verify the domain. Copy Text for record from blogger. 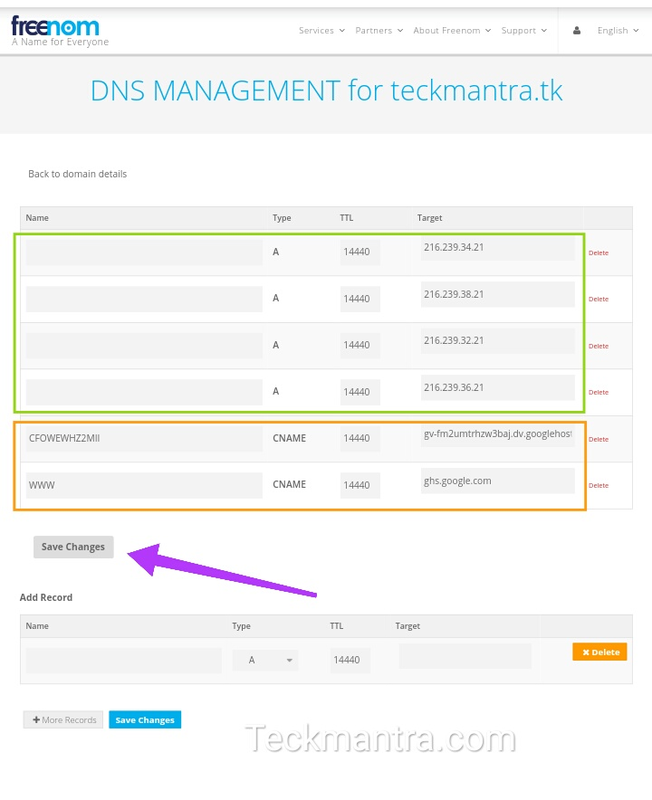 Here the final screen shot from Freenom DNS of two CNAME and four A Record. It may take some time to save. If not Try on clicking on save button without refreshing the page. Almost set Your custom domains appears on your blogger settings. Click on Edit Button there. Check on Redirect through www and click on save button. That's all search your domain name in your address bar. 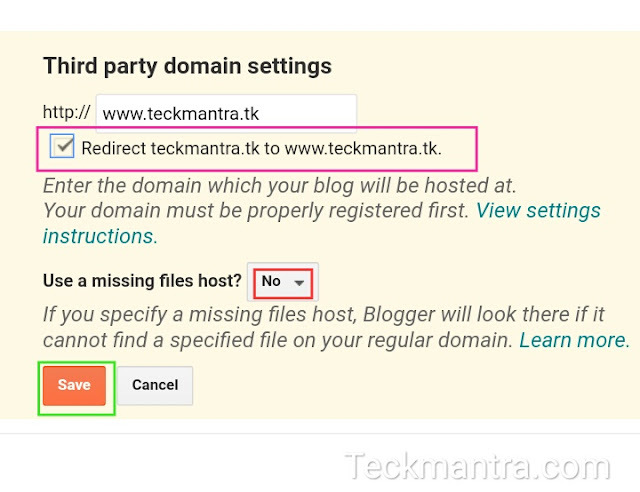 Here all setup How to add dot tk (Freenom free) Domain with your blogger blog website. Now your website looks like www.example.blogspot.com to www.example.tk. A CNAME full Name as Canonica Name, is an entry within DNS (Domain Name System) that specifies where someone can find your web pages. You'll use the CNAME to associate your custom domain with your blog. After registering your domain, decide if you want to use a particular sub domain for your blog. For example, blog.example.com instead of www.example.com. A record for Address it's points the server Address. In case of blogger the Hosting address is towards google .so we put Here the four google IP. Here the shortest method how to register a free domain (.tk, .ml, .ga, gq, . cf) for your hosted or non Hosted website. The Details Taken from their Respective official websites. For Business Inquiry Check our About us page. Thanks for all the useful insights. We have a tendency to are planning to be amendment this post with new information. this is often terribly an exquisite post. I appreciate your exertions. Keep posting new updates with us.